getcalc.com's Arithmetic Progression Calculator is an online basic math function tool to calculate the sum of any number series that follows a common difference between the consecutive terms. This sum of series calculator and associated information may help students, teachers, parents or professionals to learn, teach or practice the calculations very efficiently. Users may found the answers for following queries by using this AP calculator. what is the sum of first n natural numbers? what is the sum of numbers between the range? what is the sum of first n odd numbers? what is the sum of first n even numbers? what is the sum of first n positive integers divisible by x? 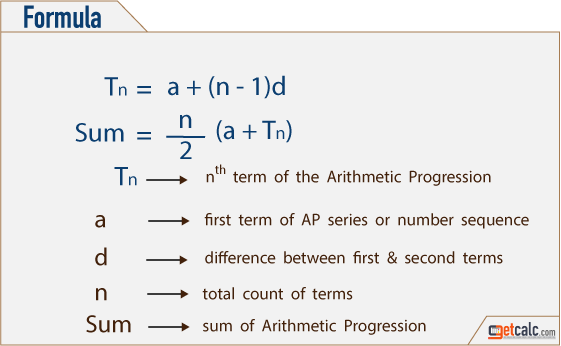 Arithmetic Progression often abbreviated as AP in mathematics, is one of a basic math functions represents the series of numbers or n numbers that having a common difference between consecutive terms. It's one of an easiest methods to find the total sum of any number series that follows arithmetic progression. In practical scenario, finding the sum of first 5000 natural numbers or positive integers becomes very tedious task if user is not applying any math formulas, while it's a very simple task if the user is familiar with arithmetic progression. For example, the number series 1, 2, 3, 4, 5, . . . 5000 is an arithmetic progression, where 1 is a first term a, the common difference d is 1 and the total number of terms n is 5000. Therefore, the sum of above AP series is 1 + 2 + 3 + 4 + . . . + 4,999 + 5,000 = 12,502,500. It's very useful function in mathematics to find the sum of series that having large set of numbers that follows arithmetic progression. 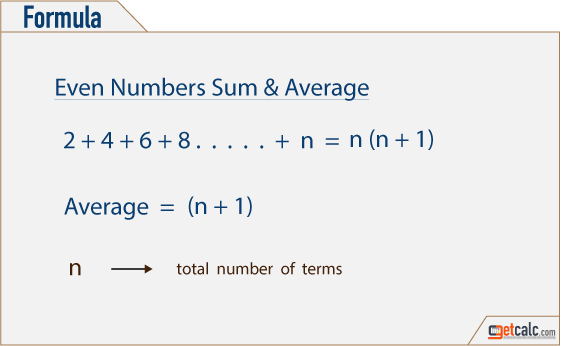 What is the sum of first 100 natural numbers? What is the sum of first 100 even numbers? What is the sum of first 100 odd numbers? What is the sum of first 100 numbers divisible by 3? What is the sum of first 100 numbers divisible by 7?